The Megalarm P200i provides an effective and easy to install alternative to a fully wired alarm system. Designed for applications ranging from retail units to site cabins and temporary work shops. This Unit is versatile, cost effective and well styled. Powered by a 9v battery and featuring a low battery warning, the P200i is entirely standalone and very straightforward to install. With resettable call point technology incorporated as standard, the P200i is easy to operate in an emergency and simple to reset after the alarm has been sounded. 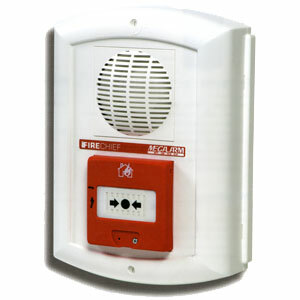 A powerful 90db siren ensures that the alarm is raised effectively, allowing prompt evacuation procedures to be carried out. The recently introduced P200i enables multiple units to be interlinked. This increases the effective coverage of the system and gives greater flexibility.